On June 12, 2015, I will be five years with no Parkinson’s symptoms. Five years with no Parkinson’s Disease. I am cured. I am joyful. I am grateful. This leads me to the point of fear…and faith. There are people who are afraid to “jinx” themselves by doing the very thing I am doing here today — celebrating five years of being cured from Parkinson’s eleven days in advance of the “official” day. That is the epitome of fear. Instead, I have faith. Faith in my life. Faith in my Higher Power. Faith in my cure. For those of you who are new to this website and blog, I say cure because I did the Parkinson’s Recipe for Recovery® and became symptom free…and I stopped doing the Recipe. In the last five years, the only time I have done the Recipe is to prepare for a workshop. No symptoms have returned, and they won’t. That is faith. That is cure. Remember: Faith. Attitude. Action. Progress. Cure. Remember: Patience. Tolerance. Acceptance. Surrender. I have been been doing Parkinson’s Coaching full time for over four years, and for the opportunity to work with those of you who have signed up for coaching, I am grateful. In celebration of my being five years symptom free from Parkinson’s, I have an offer for you to help make Parkinson’s Coaching more accessible. I offered this same offer last year and it went well for quite a few of you. If you sign up by June 30, 2015 for my One-Month Parkinson’s Coaching Package, the cost of your first month of coaching will be $350. That is a 30% reduction from the regular cost of $500. With this first-month $350 offer, you will receive the full One-Month Parkinson’s Coaching Package as if you had paid the regular full cost of $500. Here is a little more information about my Parkinson’s Coaching. 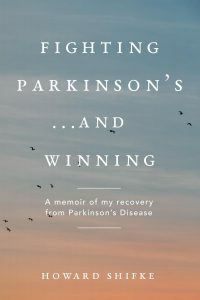 As you know, I have provided you with the Parkinson’s Recipe for Recovery® at no cost, and many of you have emailed me that you are working on it. That is great. What I have learned from many who I am coaching is that it is not the starting the Recipe that is the hard part, it is the sticking with it that is the hard part. A large part of the inability to stick with it is not understanding fully what you are experiencing. With Parkinson’s Coaching, we are in continuous communication. I can relate what is happening with you to my own experience and coaching experience, and can provide you with the explanations, comfort, and continuing support to keep you on your path to your recovery. Also, there are special circumstances for those who cannot do the Qigong exercises as they are described in the Recipe because of physical limitations — this has appeared with those of you either on medications or supplements, as well as some of you who are not taking medications or supplements but who have had Parkinson’s long enough that the exercises as described are not possible at this time. With Parkinson’s Coaching, I have re-designed the Qigong exercises, per individual, to make them just as meaningful and worthwhile for those with extreme physical limitations as they are for those who do not have these limitations. Finally, some people who are on medications or supplements are under the impression that all of the “symptoms” they are experiencing are Parkinson’s symptoms. However, sometimes, they are experiencing side effects of the medications and supplements that are not Parkinson’s symptoms at all. With Parkinson’s Coaching, I have assisted many people in not only understanding these differences, but also, have assisted them in understanding the importance of slow and safe medication reduction if that is what they are seeking. I know of thirty-seven people who are doing the Recipe and have slowly and safely eliminated their medications. Click here to learn more about Parkinson’s Coaching, including how to sign up for the One-Month Parkinson’s Coaching Package with the special offer. “You have the power to heal yourself.” Marie did, and you are. “You have the power to heal yourself.” Pratima did, and you are. “You have the power to heal yourself.” Betty did, and you are. “Together we have the power to heal the world.” When there are enough of us recovered as a result of the Recipe, we will have the power to heal the world from Parkinson’s. Congratulations on your upcoming 5th Anniversary Howard. You give so much of yourself to all of us for free in your weekly posts here. I am so grateful for the Gift you have been and continue to be in my life. God Bless You. Leo, no I have not yet crossed the finish line, but I am working towards that goal just as the rest of you are. We are all following behind Howard as our guide. We will all get there one day as Howard has proved it possible. Thank you, Howard…I am continually grateful for your incredible ongoing support… your coaching, too, is making a significant difference in my mental and emotional life….as I acknowledge these aspects of my being, my heart responds consistently with surrender…acceptance…even joy! You are an answer to so many people’s prayers! Congratulations Howard!!! You have not only blessed your life but so many other peoples lives, mine included. Thank you!! May God continue to bless you !!! Have a wonderful day!! Congratulations Howard! You give so much of yourself to all of us for free with your Recipe and weekly posts and emails. I am so grateful for your generosity and patience in our lives. God Bless You & family. Congratulations Howard!!! You have proven that it CAN be done. I’m so thankful that I found you. You are the voice of hope, light and joy! Congratulations Howard and much gratitude for your ongoing support! Congratulations Howard on your being 5 years of symptom free from Parkinson’s. You have proven the western medicine theory of Parkinsons being incurable WRONG and we will too, with your boundless generosity of knowledge, time, inspiration and guidence most of all your recipe of recovery to each one of us. Gold Bless you and your Family. Congratulations Howard. You continue to inspire me every day and each day I am grateful that you are there for us all. You’re a superhero! Thank you so much for being so selfless and caring. Congratulations Howard! We are celebrating your five years Parkinson’s free with you ! You are our Teacher, Supporter and ” tour Guide ” in our own journey to Recovery! Our big Gratitude to you! Thank you all for your wonderful and heart-warming comments! Five years went by in a blink. Please remember, I am just a few steps ahead of you on the path to recovery. I am no more special, no different, no more worthy and deserving, than any one of you. We share this life together, and I am grateful to have you as my friends and recovery community. Looking forward to watching each and every one of you have your recovery! Congratulations, Howard! Thank you for your dedication to sharing your success and bringing hope to people all over the globe! Can’t imagine where I’d be with out you. You opened my eyes, my mind, my heart and my spirit to so much and that continues to be valuable in my life everyday. Congratulations on 5 years of health, sharing and love. Your generosity leads me to heal. Your guidance inspires me to evolve and blossom. Your gigantic heart spreads love and light each day. Thank you for your immense kindness and pure goodness. I am humbled and honored to know you. Congratulations being symptoms free for last 5 years. I just joined the group to heal myself and with help of supportive group like we have here and expert coaching from Howard, I will be definitely cured. Howard, you are very generous, helpful and positive individual. Your articles are motivating and does make a difference when you have PD and needed encouraging word. Keep up the good work. WE need you. I just want to say THANK YOU!